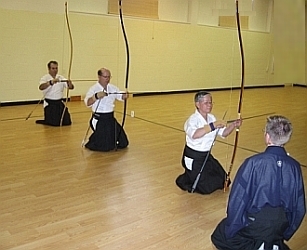 The Virginia Kyudo Renmei (VKR) conducts twice-weekly instruction in Kyudo at the Capital Area Budokai dojo. Our instructor, Mr. William Reid, is a 5th dan in the art of Kyudo. The VKR is recognized by the American Kyudo Renmei (AKR) . The AKR operates under the auspices and authority of the All Japan Kyudo Federation / Zen Nihon Kyudo Renmei (ZNKR) and the International Kyudo Federation/Kokusai Kyudo Renmei (IKYF) . The VKR adheres to ZNKR standards for both ceremonial movements and shooting. 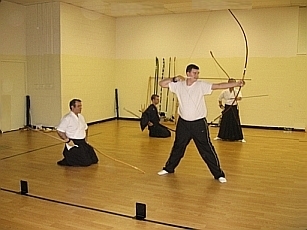 Our style emphasizes reishakei or ceremonial shooting, but students of all styles are welcome to practice with us. Please visit the VKR webpage at www.VirginiaKyudo.com for more information about this art. For more information on studying kyudo, please contact William Reid at wjreid@yahoo.com.